In a small, country town in SW Florida known for its cattle, orange trees, and cowboys, we are getting back to the simpler things in life. We brush the roosters aside when we need to enter the post office or grocery store. Residing on the bank of the Intracoastal Waterway, we enjoy the wonderful Florida wildlife on a daily basis. We frequently see manatees, alligators, waterfowl, bald eagles, hawks, pelicans, herons, sandhill cranes, gopher tortoises, bobcats and too many others to list. Although we live on almost 3 acres, we still have to abide by neighorhood convenants. I don’t think we’re supposed to have horses, cows, goats and many other farm animals. We’re probably not supposed to have ducks, but we do…only three. It’s our desire to raise our children outside (the way we grew up). We want them to be able to recognize plants, fruits, vegetables, fish and the different sounds of the outdoors. We certainly do not deny them the pleasures of modern technology, but we steer them to understand and participate in their natural environment as well. 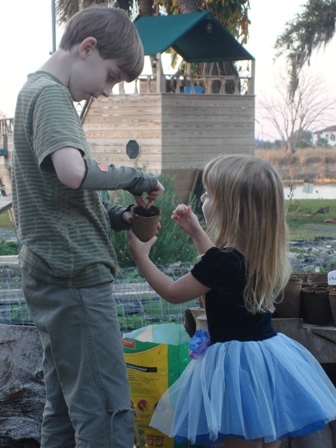 Our family shares a love for gardening. Even the toddler loves to pick plants from our garden and “serve” them to her friends. The 8-year-old is the garden tour guide. He’s proud of his work and loves to talk about it to anybody that shows an interest. It’s important to us that our children learn as much as possible about the food they eat and its source (we hope that everybody starts to question the food supply). For my part, I have a profound love for all things Jamaican. Their food, vibes, music, style and culture are a major influence on my lifestyle. I have always been in awe of the wealth of knowledge that Jamaican children have about their foods. I believe Jamaicans will never go hungry because they have “mad skillz”. I want my children to have these mad skillz too. I have traveled extensively around the world and lived in the Caribbean for half of my life. I love the cuisine of every country I have visited…this definitely influences my tendency to grow food in my garden that might seem unusual to some. When it comes to fruits, vegetables and grains from around the world, I embrace the different tastes and flavors. We invite you to come grow with us in mind and in spirit. Came across your blog while trying to get tips on how to grow ginger. Beautiful beautiful blog. Excellent blog. Good to see others in central Florida growing Moringa. Cheers. What a pleasure to find this superb site! I look forward to enjoying it again and again in the future. Thank you so much for your efforts, and carry on the good work. Found you here this morning, while looking for a huge butterfly which landed on my porch last evening. I thought it was a bat, it was so big and black! But when I took a photo of it, the flash lit up the beautiful colors on his wings, but I’m still not sure what kind he is, where he comes from, what he like to sip. He flew into the house for a few seconds then went back out and disappeared. We are planting an herb garden and a butterfly garden at the Historical Society of Sarasota’s headquarters. Can’t wait to see what we attract this fall ! What kind of lavender do you recommend for Florida that can stand the rainy summers? Thanks for a lovely site! I’m so glad you found my blog… I hope you visit again soon. As far as the lavender goes, it’s really tough to keep it alive in Florida. It’ll survive the fall and winter in FL, but the late summer humidity always does it in. I had good luck with provence lavender this past year until about July. It supposedly likes the heat & humidity, but I think our summer was too much for it. I think you’ll have the best luck with this variety in Sarasota, but you’ll probably still have to keep replacing it. I lost several herbs (pelargoniums) this summer that I’ve kept alive and healthy for years. All my basil’s still look great. Good luck with the butterfly & herb garden. It’s food for the soul. Chanced upon your blog when i was surfing for thai ginger flower. Like your thoughts and your blog and your lovely children. Something I would love to do with my own in MUmbai, India. But land is hard to get by in this metro and so we make do with terraces….! Stumbled on your blog while looking for info on Bitter Gourd. I am a fellow Floridian and it’s wonderful to see others enjoying the outdoor life. Fantastic site and it makes me want to go out in my garden right now! I’m glad you found my blog… I hope you visit again. Thanks for the nice comment! Hi, I enjoyed your photo’s and your ideas. Not too many young people today have the ability to homeschool and pass on living skills to their young like you describe. However, after living in Alva for 50 plus years, I’ve NEVER “brushed roosters aside” to enter the Post Office or a “grocery store”. LOL but it did make a nice sentence in your story. Thank you for visiting my blog and your nice complement. I don’t live in Alva and really do brush the rooster aside when I go into my local post office and grocery store. Alva is a gorgeous place. Just FYI, I try not to embellish on my blog and I try to always be very truthful. Why is it that everything I find myself looking into online leads me to your blog?! Seriously, I have come across your bog in my last several searches over the last several months…bees, quail, chickens, gardening in SW FL, etc. Once I saw that you even have the same glasses as me (yogurt post) I figured I ought to break down and post a comment as we must be long lost sisters or some such. Your blog is beautiful and inspiring. I am so happy to know someone is living the “good life” I have longed for and they are doing it right here in SW FL. And here I have been dreaming of moving north… maybe its time for me to make things happen here and just bloom where I am planted. Interested in a local penpal with many similar interests? That is so cool that you keep running into my blog in your searches… who knows, maybe weare long lost sisters. I’m glad that you enjoy my blog. It’s a ton of work but I really enjoy doing it for many reasons. I wonder, sometimes, if the grass is greener somewhere else other than SW FL. Maybe it is, but I really like what you said about blooming where you are planted. I found your blog while googling boniato and you had an article about “Mama Dos garden”. I am very happy for you and your dear children for living in a place where you could see where your food comes from. I grew up in a farm outside of the U.S. and I have to say that looking back,it was the best environment to grow up, food was plentiful & organic, tasted so much better, sun was blazing and as children we were never bored nor had difficulty sleeping at night! We ran around all day & at the end of the day, we’re ready for bed. Living in the suburb now and especially in the dead of Winter, kids tend to have a lot of pent-up energy. Poor dears! Good luck, God bless you & yours. Thanks for sharing your blog,you’re such an inspiration! Came across you site while researching whether I could grow a certain carrot in SW Florida. It is so difficult to find information on our difficult climate sometimes! Seems like zone 10 just doesn’t exist on seed packs… Thank you for your posts and information! I like how you show that Florida isn’t all beaches and sand… while I love that side of our beautiful state (we own a boat AND a canoe!) I think the hidden treasures are inland and on the riverbanks. Thanks again! How refreshing this site is…so glad to have found it. I have a question on eating ginger, have identified mine as Zingiber Officinale. Is this rizome the same as what we buy in the grocery? Or better yet is it ediable? Thank you for your speedy reply. Hi Betty- It’s so nice to hear that you like my blog. Thank you for telling me so. I haven’t done a post in awhile and I’m feeling guilty about it. I’ve actually got too much material to write about which is almost as bad as not having any. I’ll get busy on a new post today. To answer your question… yes, your Zingiber officinale is the common, cooking ginger that we buy and use from the grocery store. (I tend to plant mine in the ground so that I always have fresh ginger at an arm’s reach). It is very edible and can be used in so, so many ways. It is even considered medicinal. I like to chop it up (in big slices) and add it to a big pitcher of water. It flavors the water beautifully and doesn’t add too much gingery heat. When we drink the water, we just keep adding more water to the pitcher without throwing out the ginger. It lasts several days in the fridge this way and entices us to drink more water without having any sugar. My mom taught me to do this. For those that love the gingery heat, that can be obtained by cooking the sliced ginger in some water first. Also, ginger and fresh squeezed lime make an awesome combination. I’m so glad to have found your blog! I stumbled upon it while searching for information about the invasive Florida weed Balsam Apple (wild bittermelon) and wondering if it was edible (I know it’s NOT now 🙂 since it resembled the picture of the bitter melon on a package of seeds that I received in a sampler pack from Baker Creek. I was raised in PA and edible gardening in Florida has been eluding me since I moved here 6 years ago. I don’t have nearly as much room as you do but I’m recently inspired to try my hand with the tiny patch I do have and maybe rip up some of that yard that “society” seems to think is so important. I’m glad to find your blog as a resource for sustainable Florida gardening! I’m glad you found my blog too! If you subscribe in the top right corner, an email will be sent to you whenever I write a new post. It’s easy to unsubscribe, although I’m not likely to clutter up your inbox because I’ve been so slack with new posts. Funny that you mentioned that Balsam Apple. I spent my entire childhood wondering if that colorful little fruit was edible. It looked so poisonous, but strangely inviting. Everyday is a new lesson in sustainable Florida gardening in our yard. Having a big yard may not be better because there’s more maintenance. However, we’re trying hard to learn and use permaculture and sustainability(is that a word?) to acheive the goals for our yard. We’re figuring out what works for us. Thank you for your feedback!! I hope you’ll stop back by. Hi. I just had the opportunity to meet your sweet mother this weekend at Sea Island. I really enjoyed talking to her and hearing about all the exciting things you are doing-growing organic foods, bee keeping, and home schooling your 2 cute kids! I enjoyed reading your blog and look forward to reading more! Treasure! Excited to find other Floridians interested in good simple living. I grew up thinking the experts were doctors, lawyers,etc. Now I realize they are family, friends, neighbors and strangers willing to share what they know. Thank you for sharing your experiences and wisdom. Very, very well stated! I agree 100%. I’m Jamaican by birth and was enticed by your posts about the island and its culture (the pictures made it even more appealing!) My Dad has an acre and a half in St Catherine, on which he has several fruit tress and a personal garden along with a few animals… so I can relate. I reside in Ft Myers and have visited the ECHO farm which is quite an educational tour in itself. Perhaps one day you may be giving tours on your own estate. In any case, it’s great to view your refreshingly, informative blog. To think, I was researching Guinea Hen Weed and stumbled into this web. I give your blog two green thumbs up! Thank you for your positive words! I’m glad you did find my blog. I hope you’ll stop by again. Wonderful blog. Your children are lucky. I, myself, do not like to abide such restrictive covenants and are not used to them being from NH. Florida is just different, I suppose. Do you know where we can buy live ladybugs. We don’t need too many, 200, to help offset the spider mites attacking our veggies. Any advice? Rather buy local than order from a distance. My husband grew up an organic farmer and we’re trying to just have our own small garden. It’s recently become a challenge. Arbico Organics is a great place to buy ladybugs. Try this link… Arbico-organics.com. Punica granatum ‘sweet’ seems to be the sweetest variety. However, I googled this information as I only have experience growing one variety and it isn’t this one. Just found your blog. Fabulous. We live in hot and humid East Texas. I do a lot of crop experimentation. Getting ready to plant a variety of South American tubers. Already have some ginger growing in greenhouse. Like you, I gave sweet potato leaves a try and now consider them my hot season green of choice. I also plan on planting edibles randomly on my property for an emergency stash should the time come. Do keep up the growing and blogging! Love your blog. I just moved to South Florida (Miramar). I’m from California and I was so excited to find all these little hidden farms. Especially Marando Farms in Ft Lauderdale where I could still have access to raw dairy and organics. Can’t wait to start growing things out here my MIL already has a pretty delicious mango tree and plantains. My husbands in the military but when he gets out we hope to buy some land out here and start with goats and chickens. Not sure about the covenants in FL but hopefully its not too restrictive. Cheers! I’m new to the farm world. I am up to about 20 chickens, 3 ducks, 2 guinea hens, 2 dogs and a bunny. I’ve been looking into the Nigerian Dwarfs for a while now. We just fenced in an area in our yard for them. We are about to build housing for them. I love your idea of keeping it mobile. Where could I get a doling in the sw Florida area? I’d like to get started in the next month or so. We live in a town home in Fort Myers and are kind’a agriculturally deprived. I have Seminole Pumpkin seeds. Want some? Saw your blog, and loved all the information. Our daughter Christy has 10 acres, and wanted me to search for lychee trees that would produce often…and do well in her lot. I loved all the varied info your site provided. I’ll pass it on!!! Lovely family you have! thanks for signing me up…next: My daughter will want to sign up…she’s the Florida gardener in the family! What a lovely garden and life! I envey you. If u don’t mind sharing, where r u in SW Florida? I am avid garden but have to be content right now with a small one — zinnias, veggies, Etc…. Thanks for all wonderful posts! We are looking for goats for our 5 acres in Englewood, Fl. Do you have any for sale now? We have chickens and want to add sheep and goats. I love your story, we are retired and finally realizing our dream of a small farm life. I was following your blog and very interested. I was wondering whether you grow Tindora plants and interested to know where I can buy it. Hello, I have just come across your blog (wonderful!) as I am a beekeeper in Canada who is considering a move to the Cayman Islands. I am wondering if you have any contact info for Otto Watler as I would love to meet him and see his operation when we go there in a few weeks. I was looking for elderberry info in South Fl and came across your blog. I love what you’re doing!! I wish you were still writing! Lovely, found you via the Cayman bee story. I live up in tennessee and keep a backyard orchard. Am visiting the Cayman, how do we find the bee man?